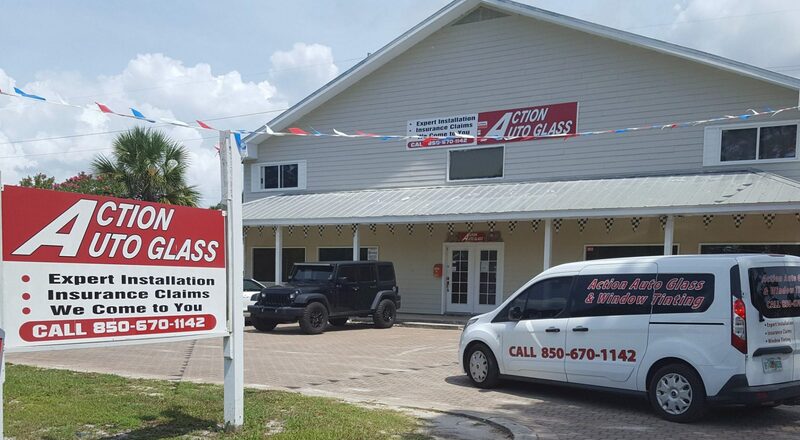 Action Auto Glass: Windshield Replacement and Repair Northern Florida. Franklin, Gulf, Bay, Wakula and Leon Counties in Florida! FREE DINNER FOR 2 WITH EVERY WINDSHIELD REPLACEMENT! WINDSHIELD INSTALLED AT NO COST TO YOU WITH FLORIDA COMPREHENSIVE OR OUT-OF-STATE GLASS COVERAGE! Call (850) 670-1142 now or fill out our contact form for a FREE quote. Need quote to repair your chipped windshield? Need quote to replace your cracked windshield? Need quote to replace one or more of your car’s windows? No problem. Just call Action Auto Glass. The experts at Action Auto Glass are the best auto glass replacement and repair specialists. We’re prompt, efficient, and affordable. Got glass insurance? Great! We’ll bill your insurance company directly at no cost to you. Need auto glass repair on the Panhandle Don’t wait. Call (850) 670-1142 now to get your quote. Our shop is also equipped to perform high-quality window tinting work so that you can increase the privacy of your car and protect the interior from harmful UV damage. We’re happy to offer flexible appointment availability seven days a week, and we’ll make it easy to drop off and pick up your car.